The Supreme Court, in Saloni Arora vs. State, reiterated that in order to prosecute an accused for an offence punishable under Section 182 IPC, it is mandatory to follow the procedure prescribed under Section 195 of the Code else such action is rendered void ab initio. The Supreme Court in Aires Rodrigues vs. Vishwajeet P Rane, held that a notification issued under Criminal Law Amendment Act of 1932, is still relevant and the notification with reference to old Code of Criminal Procedure of 1898 should be read as having been issued with reference to Code of Criminal Procedure, 1973. The Supreme Court in High Court of Judicature at Patna vs. Ajay Kumar Srivastava, upheld a Patna High Court judgment, which had set aside an order of compulsory retirement of a district judge, on the ground that it was passed as ‘punishment’ without conducting disciplinary enquiry. Questioning the transparency in their functioning, the Supreme Court on Tuesday ordered compulsory audit by March 31, 2017 of nearly 30 lakh NGOs, most of them who receive funds worth crores of rupees from the government and abroad. 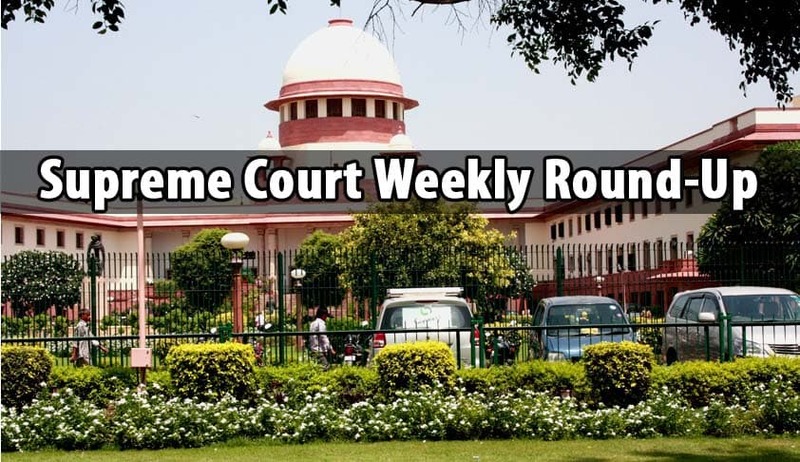 Though it granted Leave to Appeal, the Supreme Court refused to stay the Madras High Court judgment which had quashed the appointment of 11 members to the Tamil Nadu Public Service Commission. A three-judge bench headed by Chief Justice of India JS Khehar said the state can enter a fresh selection process for members of Public Service commission. The Supreme Court on Wednesday dismissed a PIL which sought quashing of a provision of the Income Tax (IT) Act which gave tax exemption to political parties on receiving voluntary contributions. In a two page order, the Supreme Court set aside a high court and Central Administrative Tribunal order, observing that a direction to give compassionate appointment several years after death was not justified. The Supreme Court on Wednesday asked liquor baron Vijay Mallya to file within three weeks his response to an allegation raised by a consortium of banks led by State Bank of India that he had transferred USD 40 million to his children in brazen violation of judicial orders. The Supreme Court on Thursday took a serious note of Sahara chief Subrata Roy’s plea for extention of time to deposit Rs 600 crore saying he would have to go to jail in case of a default and did not pay up by February 6. The Supreme Court bench of Justices Pinaki Chandra Ghose and RohintonFaliNariman on Monday dismissed as infructuous the writ petition filed by a NOIDA student, AnupriyaNagori, against the selection of the BJP Vice-President AvinashRai Khanna as Member, National Human Rights Commission, by the Selection Committee.